birds | Leon Marais Travel Writing and Photography. #Birdstorm: a million wings overhead. It’s reputed to be the most numerous bird on earth. Flocks can number in the millions, creating black swarms that can devastate a field of grain crop in a single feeding session. Nesting colonies can cover hectares of land, attracting all manner of predators out to make the most of the bounty. Yes, it’s the diminutive Red-billed Quelea (Quelea quelea), smaller than a sparrow, generally brown with an orange to red beak, while the breeding males sport black and red faces. Individually they don’t add up to much, but in large numbers they are an impressive sight indeed. On a recent holiday in the Warmbaths area of South Africa’s Limpopo Province, I was out on a mountain bike searching for a bird hide I’d been told about. When I found the hide on the edge of a small pond, I took vague notice that the reeds in the pond were all bent over, looking like a hail storm had rolled through, though being winter that wasn’t a possibility. In the late afternoon I took my family out on a game drive, and when we arrived at the pond we were confronted by an astounding sight: the place was absolutely bursting at the seams with roosting Queleas, the combined chirping creating an incredible noise, like the roar of Man United fans at Old Trafford. We didn’t want to disturb them too much and so didn’t spend a lot of time there, but I returned early the next morning to watch them leave for their feeding grounds. They started to leave before sunrise, peeling off in clouds and always heading due south. The clouds gradually diminished in size and eventually one could start to hear the calls of Black Crake, Common Moorhen, Lesser Swamp Warbler and other denizens of the pond as the din of the Queleas diminished. I wondered why they left in sub groups, and then realised that, due to the numbers, those perched lower down on any given reed had to wait their turn to be able to move to the top of the reed for a successful take-off. Well, if the morning experience was incredible, I was even more blown away in the afternoon, when I arrived just as they began to return from their feeding grounds. The flocks of perhaps hundreds of thousands at a time would fly in from the south (just seeing these flocks in flight was an awesome experience) to land in the thorn trees surrounding the pond, more and more arriving as the sun set. Eventually they decided it was time to settle in the reeds, and this is when I realised I was seeing one of the natural history highlights of my life. Massive flocks of birds would swirl around the pond, flying right over the hide I was in, with the noise and wind produced by the millions of beating wings literally blowing my hair back. Flock by flock they would settle in the reeds, with the noise gradually shifting from beating wings to chirping until all of them had found a place to perch for the night, the chirping continuing undiminished (I wondered if they chirped all night long?). The South African Bird Atlas Project mapping shows that Quelea distribution is on the increase across Southern Africa, especially in the Western and Eastern Cape regions, perhaps as a result of increased areas under grain cultivation. So big flocks are probably becoming a more often seen phenomenon, though this was the largest and most concentrated gathering of Queleas I’ve ever seen (the big breeding congregations I’ve seen in the Kruger tend to be spread out over a number of hectares, where’s this flock was concentrated in a tiny area). With darkness upon me it was time for me to leave, creeping away so as not to disturb the birds and hoping to bump into an Aardvark or Aardwolf on the way home. I likened the Quelea experience to watching an Amur Falcon roost in Creighton with the venerable Malcolm Gemmel of Button Birding. That’s pretty impressive, with thousands of the migratory raptors roosting in a couple of Plane Trees in the local sports ground. They seem to exhibit the same behaviour, swirling around overhead until they decide it’s time to come in and land. They also chirp and twitter as they do so, but the total number of Amurs at that roost would probably only constitute one or two of the flocks of Queleas at the pond roost, that’s how impressive it was. To get an idea of what it was like, watch our video on YouTube, and make sure to have the sound up to reasonable levels. 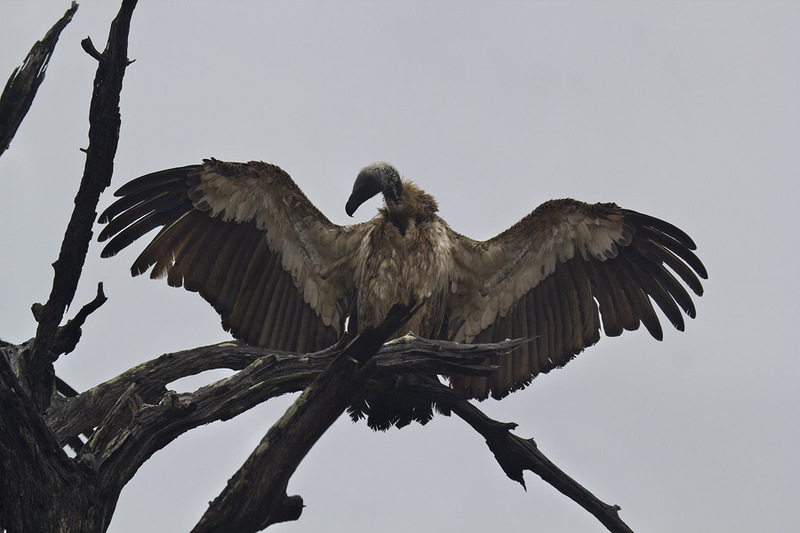 Photo of the Day: White-backed Vulture. 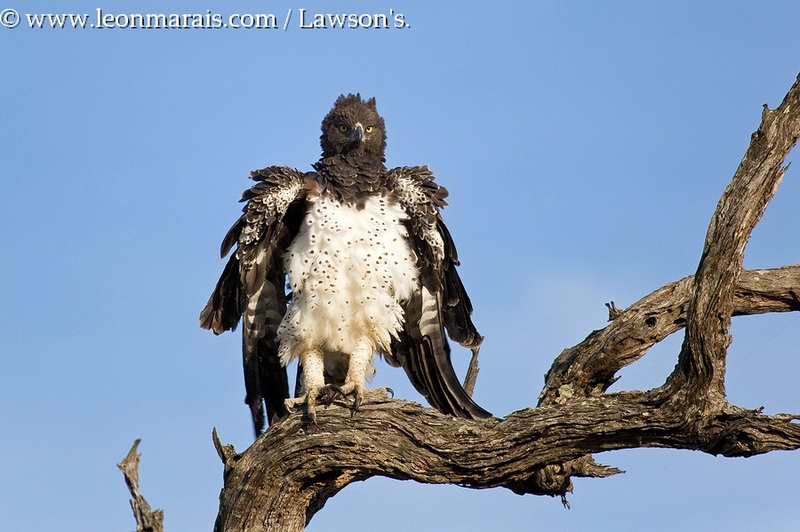 October is usually a dry and hot month in the Kruger National Park. 2012 proved to be a bit different, with summer rain arriving as early as the first week of September, nearly two months earlier than expected. On one of the mornings at Satara Rest Camp in the central plains region the heavens opened at 05h15, precisely the time my group arrived at my chalet for morning coffee before the drive. Plans had to be put on hold while the storm raged on, but eventually at about 08h30 we were able to go out and look for game. While the big cats were proving to be elusive yet again, the birds were out in full force trying to dry off while it was not actually raining. Vultures in particular need to dry out as fast as possible, for they are heavy birds and with wet feathers they can’t get airborne to head out in search of the days dead and dying. On the S100 running along the N’wanesti Creek we came across several ‘vullies’ sitting in a dead tree, and we stopped to snap off some shots. Somehow, with the lighting and the stark lines of the dead branches, the scene became a little surreal, as if we had been transported back in time and were viewing a prehistoric bird. It might sound a bit strange, but then again this kind of scene has probably been playing out here for hundreds of thousands of years, almost unchanged apart from the road we were on. As is often the case, the softer lighting created by the diffusing effect of the clouds brought out the finer features of the bird’s plumage well, even though a bit of dynamic range recovery was needed to re-create the original viewing conditions.